One Pot Vegetable Pasta! Throw everything into a pot, and you are done! Loaded with vegetables like peas, spinach and mushrooms. I’m ready to make good on my promises. For the rest of the month, I am bringing you healthy, weeknight meals that are as simple to put together as they are delicious. As I mentioned last week, one of my New Year, New You things I’m working on is weeknight dinners. You know, actually sitting at a table enjoying healthy, satisfying food and chatting with BL about our day. The complete opposite of what happens 80% of the time- scarfing down cold leftovers because we are a.) too lazy to heat them up on the stove and b.) so hangry it hurts. We then retreat to our individual laptops to work in relative silence before heading to bed. It ain’t a pretty picture, but it’s the truth. And, if we are being honest, I bet this is a scenario that you are familiar with as well. Hopefully, not as frequently, but in the case of two working professionals, weeknight dinners tend to get pushed to the back burner. Nutrition aside, sitting down to a weeknight dinner helps me unwind my day and reconnect with BL. So, here we go. A month of weeknight dinners to help us all get there. And, shock of the century, we are starting with pasta. I know I’m a little late to the party, but I wasn’t sure how I felt about all the one pot pastas littering Pinterest last year. While I loved the “throw everything in a pot and you’re done” idea, I wasn’t quite sold that it would be anything to write home about. You all know I take my pasta VERY seriously. But, in an effort to really make weeknight meals happen and not just pretend that I’m going to do them and then reach for takeout, I decided to give it a whirl. PINTEREST for the win. I take back every eye roll I ever gave to one-pot pastas. These babies are amazing! Throw it in and you are done. Done done. Like actually clean your house while dinner is cooking done. (Don’t get your hopes up BL, it’s only a suggestion). 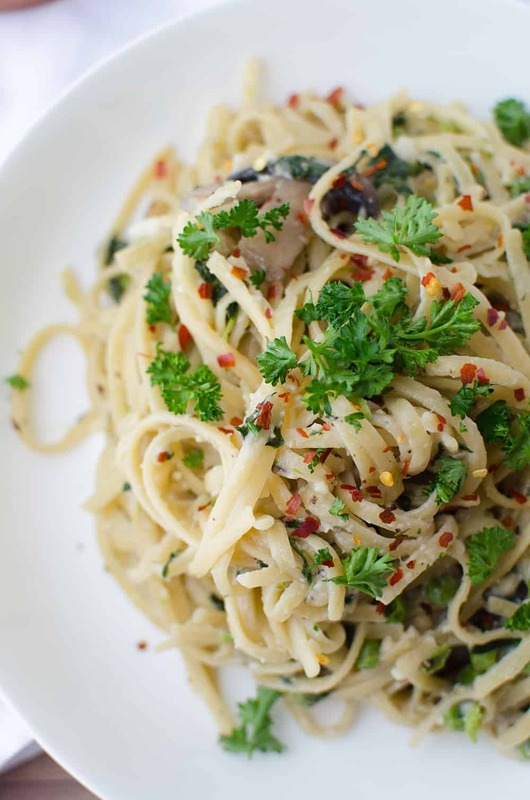 Similar to pasta primavera, this dish is bursting with flavor- and packed with vegetables. What I like most about this dish is how customizable it is. Don’t love mushrooms? Use broccoli or zucchini instead! Watching calories? Omit or cut down on the splash of cream at the end. Whatever your goals, I promise this is a dish you will be reaching for over and over again. I think my favorite part of this meal, besides the pasta, are the frozen green peas. 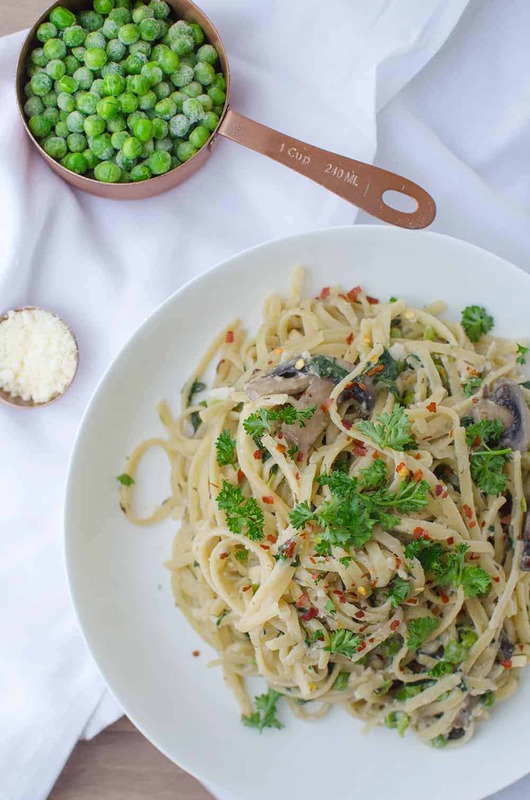 I love love love green peas and will use any excuse I can find to add them to pasta. 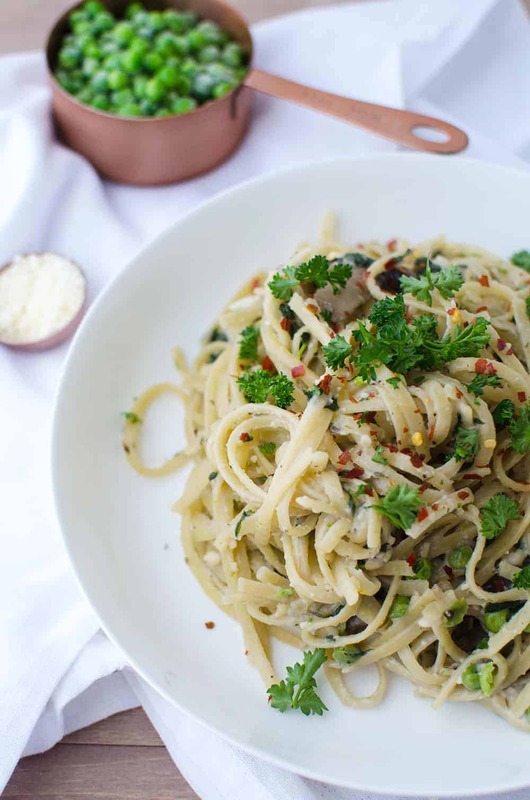 Adding in a ton of vegetables also makes this pasta more nutrient dense. That means a cup or two of pasta really isn’t a cup or two of noodles. To up the nutrient density even further, cut down on the pasta and add in more vegetables. What weeknight meals would you like to see this month? One Pot Vegetable Pasta! Throw everything in a pot and you are done! Loaded with vegetables like peas, spinach and mushrooms. Vegetarian and easily vegan. Place all ingredients except for the cream and cheese in a large saucepan. Bring to a boil then reduce heat to a simmer for cook for 10 minutes until the pasta is al dente, stirring occasionally. 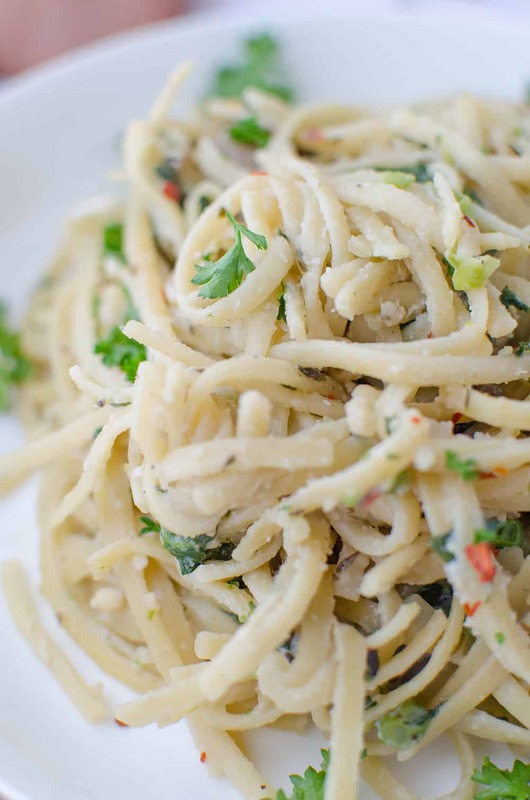 Once pasta is cooked, remove from heat and stir in a pinch of salt, freshly ground pepper, milk/cream, and cheese. Unreal gorgeous & easy too?! I’m sold. I love a good one pot pasta! This sounds great and your pics are gorgeous! I’ve yet to try a one-pot pasta dish either! This one looks so delicious and I like how you could change up the veggies depending on what’s seasonal. I think some asparagus would be awesome here in the spring. I love these kinds of recipes that are quick and easy to make as well as tasty. Sounds like easy clean up too. Totally love this concept, easy to make, easy to cleanup, and one delicious dinner! Yum! Pinning! Thanks! They are addicting to make! I can’t stop the one-pot pasta dinners! YUM!!! Great photos Alex! I love the mushrooms in this, I am definitely trying. Thanks! Am I blind? I don’t see the pasta listed in the ingredients. AH! Sorry Sara- how did I forget the pasta? *face palm* just updated it now! 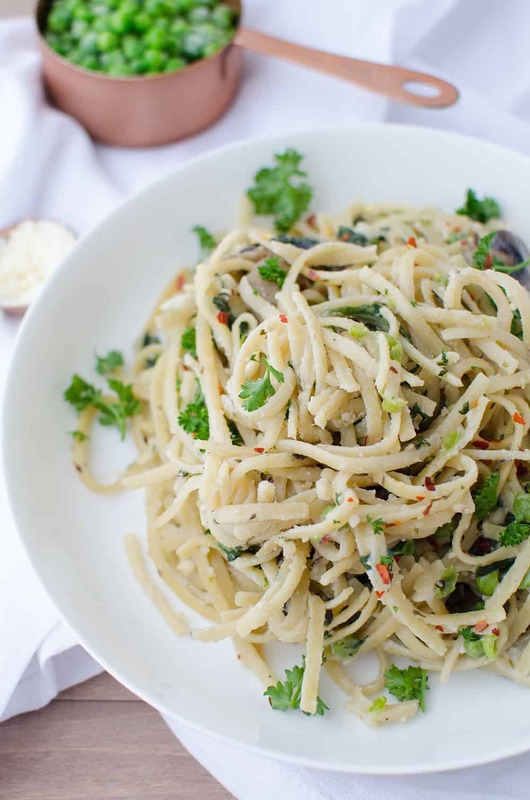 LOVE one pot pastas! This looks so good! Just want to double check. I’m about to make this (literally) and I’m wondering… is 4 1/3 cups of water all you need? I’ve never made a one-pot pasta dish so perhaps it’s just me. Seems too little. Please let me know. Thanks!! That’s it! The pasta should come out al dente with a little water reserved to make the sauce. However, always check! If it gets too dry, the just add a bit of water. I’ve made this several times and the 4 1/3 seems to work for me, but you might need to increase to 4 1/2 depending on how saucy you like it! Wow! Thanks for the quickest response known to man!! I’m so excited to give this a try! Okay, here goes. Thanks again!! Delicious!! Worked out perfectly as you said. Thank you! Awesome! Thanks for letting me know that cashew cream works! I’m going to add that note in the recipe, thanks Katie!